Our G1000 is an all-glass avionics suite designed for OEM or custom retrofit installation on a range of business aircraft. It is a seamlessly integrated package that makes flight information easier to scan and process. Its revolutionary design brings new levels of situational awareness, simplicity and safety to the cockpit. 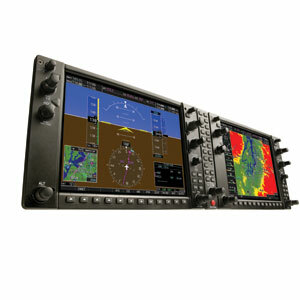 Featuring a flexible design, G1000 adapts to a broad range of aircraft models. 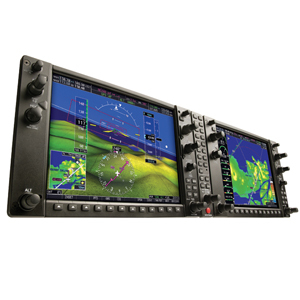 It can be configured as a 2-display or 3-display system, with a choice of 10" or 12" flat-panel LCDs interchangeable for use as either a primary flight display (PFD) or multi-function display (MFD). An optional 15" screen is also available for even larger format MFD configurations. G1000 replaces traditional mechanical gyroscopic flight instruments with our super-reliable GRS77 Attitude and Heading Reference System (AHRS). AHRS provides accurate, digital output and referencing of your aircraft position, rate, vector and acceleration data. It’s even able to restart and properly reference itself while your aircraft is moving. G1000 seamlessly integrates built-in terrain and navigation databases, providing a clear, concise picture of where you are and where you’re heading. A Jeppesen® database supports onscreen navigation, communication and mapping functions. For safer arrivals and departures, optional ChartView™ — available through Jeppesen’s JeppView™ subscription service — lets you overlay your aircraft’s position on the electronic approach chart to provide a visual crosscheck. 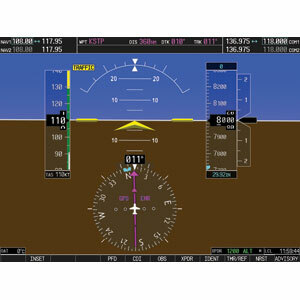 Using information from the built-in terrain, U.S. and Canadian obstacles databases, G1000 displays color coding to graphically alert you when proximity conflicts loom ahead. In addition, you can augment G1000 with optional Class-B Terrain Awareness and Warning System (TAWS) for an extra margin of safety in the air. View your position on taxiways with SafeTaxi®, a built-in database of either U.S. or European airport diagrams. Optional FliteCharts®, an electronic version of the AeroNav U.S. Terminal Procedures Publication, lets you quickly find and view all AeroNav Departure Procedures (DP), Standard Terminal Arrival Routes (STARs), approach charts and airport diagrams on the MFD. For added visual orientation, optional SVT recreates a 3-D “virtual reality” database landscape on the pilot and copilot PFDs. Thus, SVT enables you to clearly visualize nearby flight and enroute navigation features — even in solid IFR or nighttime VFR conditions. With an optional subscription to XM WX Satellite Weather and the addition of a GDL 69 or 69A data link receiver, you’ll have access to high resolution weather for the U.S., right in the cockpit. 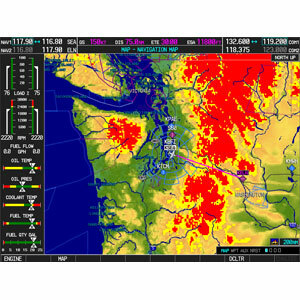 GDL 69 provides NEXRAD, METARs, TAFs, lightning and more that can be laid directly over Jeppesen and topographic map databases. For global weather information, an optional GSR 56 can connect you to the Iridium satellite network, which also provides voice and text messaging connectivity, as well as position reporting. 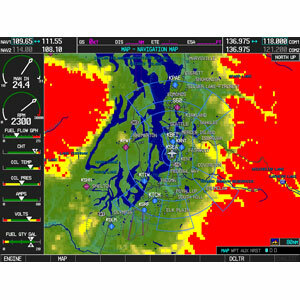 For the best in “scan-your-own” weather analysis, G1000 can be interfaced with our GWX 68™ digital color radar. At 6.5 kilowatts, it packs the power to penetrate serious weather. Add a Mode S transponder, and G1000 will also display Traffic Information Services (TIS) alerts that identify surrounding air traffic.